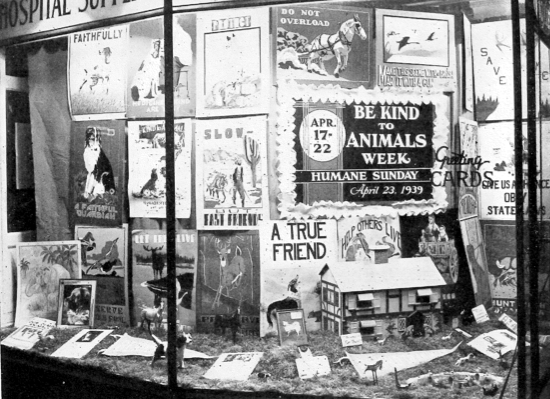 This photograph shows the front windows of a pharmacy in Hyannis, Massachusetts decked out for Be Kind to Animals Week® in 1939. In addition to colourful posters advocating for everything from compliance with State laws and awareness not to overburden the loads of horses, many of these posters underscored the bonds between humans and nonhuman animals. “A TRUE FRIEND,” one poster of a dog proclaims, “A FAITHFUL GUARDIAN,” states another. At the bottom of the display are framed images, pennants, and small figurines of various animals.